"Well, there are many things to do in Jehovah's service and spending time in the ministry is more important. With time rapidly diminishing for this old system, playing around with stuff like this seems to be a wast of it, time that is. Now is not the time to relax, but to put more emphasis on our service to the grand creator Jehovah. "Thanks to everyone who has used and continues to use this software." Since I saw this as a valuable resource for the friends in the Palm community, I hated seeing it just fade off into the distance. So with ATDTech's help, the site will remain online under the care of Paragon InfoSystems. Have you ever wondered how many Cubits are in a Mile? Or how much is a Bath measure? Now you don't have to guess. Scales provides you with an easy to use interface that performs all the math for you. It covers Dry Amounts, Liquid Amounts, Length and Weight. Do you like riddles, thought provoking scripture based ones? This is the program for you. The database is a compilation of many riddles you have heard over the years. There may be some that are not in this file, email me and I will put them in the next release. Quiz Me is a great way to work the brain. Service Overseer will assist in tracking the groups you visit, and the talk you share with them. You are able to produce your talk and save it right in this applcation. Sort option allows you to filter through the groups. From publisher to Circuit Oversser, this one is a must. Similar to the Contact or Address book on your PDA, but built for those within the circuit. Keep names, address, phone numbers and congregations they are associated with. Easy to use and quick. Now has Pass Code Protection. Wonderful tool for those who give public talks in and out of the congregation. List all the outlines you have by number and title, show your schedule for your upcoming assignments and even keep the contact information for the congregation you visit. 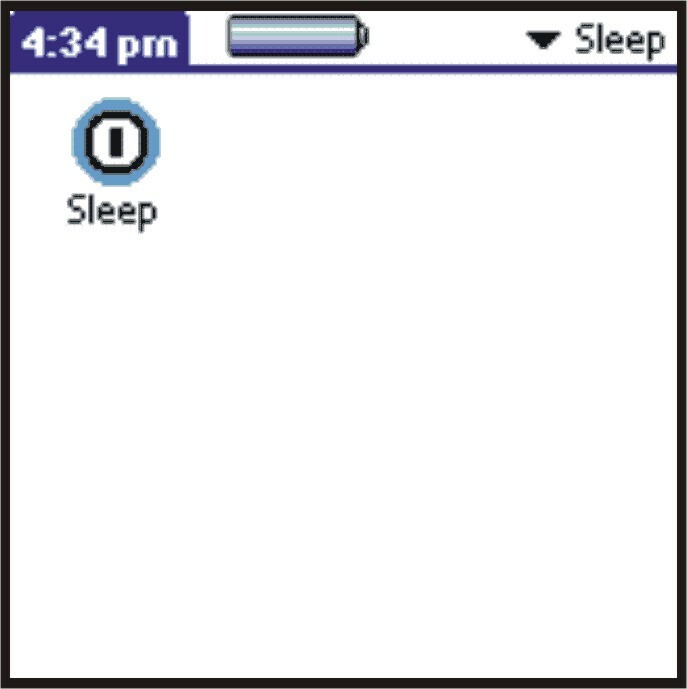 Future version will place your talk assignment into your Palm OS Calendar application automatically. Developed for those on the PVG and HLC. Keep up with the members, contact information and assigned hospitals. Patient details can include the hospital, room, reason for hospital stay and a check list of items. A database of information is provided for reference to important information. A quick and easy way to track Not at Homes on your Palm OS device while in the field ministry. The simple interface makes it easy to add the house number, street, date, territory number and the action. For example, NH = Not Home, CA = Call Again, DNW = DNW and X = Delete. There is a Read Me file to give you all the details. You will find this to be a very handy application. Enjoy. Concerned about the quality of public speakers within or visiting your congregation? Use this tool to make a simple evaluation of the overall quality of the speaker. Of course, this isn't a catch all program, but it gives you an edge for evaluation. If there is more than one Palm OS device user among the brothers, compare notes after using it. The objective is to have the best speaker possible. Based on the Wt article from 12/15/01, this application offters the practical biblical daily guidance. The article helped us focus on being better humans and companions. Select a day based on current date or chose one randomly. 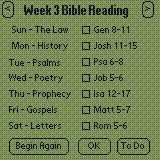 This application does NOT integrate into the Palm Calendar/Datebook. Clear biblical pronunciation in a whole new way for the Palm OS. It's simple. Search, tap and listen to a Bible name you need to know how to pronounce. Theo Talk provides you with on the fly assistance for the pronunciation of biblical names. The database contains over 3400 sound files that are run from your memory card. NOTE: The quality of sound is based on your particular type of handheld and its built in speaker. Here is the hard work produced by a dear friend, missionary and spiritual brother who has fallen asleep. The NWT Reader is an excellent stand alone bible with many features. The text documents provide the answers to all your questions about how to use it, which is very easy. 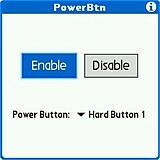 This project will no longer be developed, but in it's current state will be hosted here for all to use. A "User Name" and "Password" are required for this page. Both will be in lowercase characters, no spaces, no punctuation. The "User Name" is "kevin". Password Clue: "Time and unforeseen..." 3 letters and 3 numbers, no spacing. Due to popular request, version 1 of reporter is put on the site. Be aware though that there is a serious logic bug in the program. When the monthly report is generated, the number of Bible studies will be wrong (it will be the number of times you conducted Bible studies instead), so you will have to adjust it manually. July 8, 2002 : Slight update to Reporter, bringing it to version 1.1.1 - The sort order of the reports was reversed so as to have the most recent report on top - On Paml OS 3.5 and above, when the privacy settings are on Hide or mask records, Reporter will ask for the password before opening, and restore the privacy setting on exit. It is still a Beta version, although stable enough for day to day use. The main change in this version compared to release dev 3 should solve the random crashes that happened from time to time. I found a buffer overflow that occured when entering credit time. Another change concerns people with a big screen (T3, T5, LifeDrive or TX). Now when you have a field trip open (with the screen maximized) and enter a note, and then move to another program, the note is saved together with the rest of the field trip information. Using the bigger screen size that way is a bit more problematic than I expected, but it still is a good way to use the extra screen real estate and I will probably extend this to other places where it makes sense. Some have had difficulty removing this file from their device. Use FileProg or FileZ and then delete from your computer. This page provides Theocratic tools for Jehovah's Witnesses. All products may be used and shared freely at NO CHARGE. You must have a Palm OS device running a minimum of OS 3.5 in order to use the majority of these applications. All applications on this page, with the exception of the Guest Software, were developed by Kevin Bingham and are his sole and expressed intellectual property. No reverse engineering, copying or duplication may be done without written consent from said author Kevin Bingham. Copyright 2004 ATD Tech Software. All Rights Reserved.